The Caltrans Demonstration, Development and Evaluation Program is an adaptive management-based program designed to test, measure and improve the effectiveness of upland restoration and erosion control practices on drastically disturbed slopes. IERS has been collaborating with Caltrans and UC Davis for 8+ years to address current and upcoming water quality regulations through sediment source control treatment approaches. 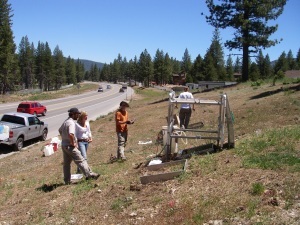 The program includes design and construction of treatment test plots at more than 10 sites throughout the Tahoe region, quantitative monitoring of erosion control and revegetation effectiveness, and annual reporting with treatment specification recommendations. The program has focused on a wide range of drastically disturbed sites, including road cut/fill slopes, ski runs, and dirt roads. IERS uses a range of field monitoring techniques including vegetative and soil cover monitoring, soil density measurements, and simulated rainfall and overland flow to assess the sediment source control effectiveness of various restoration treatments. This program, in collaboration with Tahoe regulatory agencies, pioneered the development and application of quantitative success criteria derived from a large body of field-measured data. This program is providing Caltrans with defensible data and treatment tools to achieve compliance with upcoming TMDLs and meet existing NPDES permit requirements.